Arisa, Weasel, and Prince Edoran are searching for the missing fabled sword of King Regalis, and they uncover a secret plot involving a kidnapper, a silent assassin, and a fiery tavern keeper. 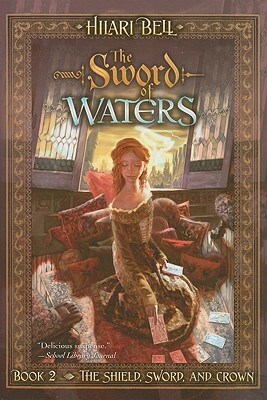 Unable to trust anyone in the palace, the three friends unravel the mystery of the sword while keeping one step ahead of the traitors in their midst. I am falling more and more in love with this series! The awkward and adorable friendship between Arisa, Weasel, and Prince Edoran makes me smile in every chapter! I especially like that they don’t always get along. They have misunderstandings, they call each other names, and they get angry at times, but the thing that binds them together is that they can be real and honest and true with each other, instead of having to pretend and perform and be on their best behavior like they do with the rest of the world. I just adore everything about these characters! The plot kept me guessing on every page, and I loved all the wild plot twists. The characters are so endearing and approachable. I love the depth and background of each character, and how their personalities develop through the story. The circumstances of the plot and the complexity of the connections between people, their political alliances, and their family past, really serves to bring forward the emotional relationships and the consequences of every turn of the plot. It’s all so beautifully woven together! The writing is excellent, and really draws you into the story, until you forget that you are reading! I saw that you are a book blogger. I recently released a book “Life of Randy” I would love it if you would review on your blog with an honest review. If you are interested I can send you a free copy in your preferred format. No, thank you. I am not interested.